Not only do donor-advised funds allow you to easily make charitable contributions to the organization of your choice, but they also allow many people to further reduce their tax obligations under the new tax laws. Since the passage of the 2017 tax law, donor-advised funds have become an increasingly important vehicle for charitably-minded, tax-conscious individuals and families to benefit further from their charitable donations. In prior years, you may have enjoyed a tax benefit by including your charitable contributions in your list of itemized deductions. The new tax law significantly raised the standard deduction for both single and joint filers and simultaneously limited deductions available from state and local taxes, which may hinder or in some cases eliminate the tax benefit of your annual giving going forward. In this Navigator, we provide an overview of donor-advised funds, discuss how they can help you and your family achieve your charitable intentions, and explore ways that these investment vehicles can reduce your taxes in the new tax environment. A donor-advised fund is an easy, tax-efficient way to contribute to your favorite charities. Anyone can open a fund with an initial contribution of $5,000 or more, after which the fund is professionally managed and invested for future growth. Once a donor-advised fund has been established, the donor can make contributions to charities out of the fund’s assets at any time. Donor-advised funds are offered by a number of major custodians and are held by a non-profit entity. For example, Charles Schwab’s donor-advised fund is offered via Schwab Charitable, an independent 501(c)(3) organization. Gifts to the fund can be made with cash, securities, and/or other non-cash assets such as real estate or art. Gifts to the fund are considered irrevocable gifts of personal assets: once the contribution is made, the donor cannot recoup these assets. Donors receive same-year tax benefits for the value of their contributions to the fund if those contributions are made before the relevant calendar year-end deadline. 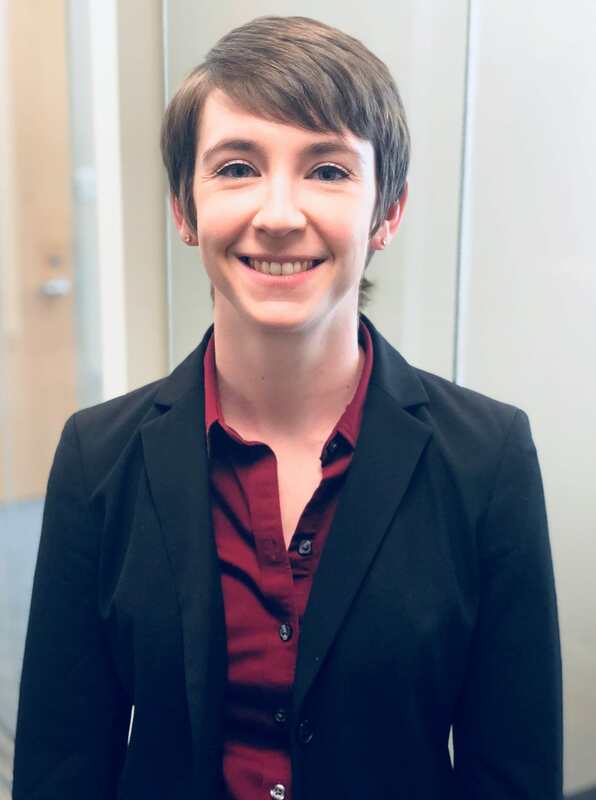 Contributions to a donor-advised fund are subsequently invested and can grow before you make a donation, and all growth of the funds is tax-free.1 Conversely, should the amount of money available for donation purposes could decline as well. Any appreciation of value in the donor- advised fund allows you to contribute more to your favorite charities. However, there is no additional tax deduction for giving assets to charities that appreciated while held in a donor-advised fund. Generally, donors can designate any organization to receive a gift as long as the organization is a legitimate, IRS-approved nonprofit entity. Donors can contribute to the fund at their convenience. There is no restriction on the number of contributions made, though there is typically a minimum contribution size of $100. Who Should Use a Donor-Advised Fund? For those who do not make charitable contributions or who already make very significant donations, a donor-advised fund may not provide a tax benefit, although it may push forward tax savings that would normally be spread out over multiple years. For those who make gifts to charities on a regular basis, opening a donor-advised fund and pre- funding multiple years of donations during a single tax year can maximize both your ability to give charitably and your ability to generate tax savings, even under the new tax law. You really can have your cake and eat it too! As an alternative to a donor-advised fund, some choose to start a private foundation to manage their charitable giving. A foundation is typically set up via a one-time large donation that is invested and managed by a board of trustees. However, due to the size of the contribution needed to start a foundation (>$1 million), the donor-advised fund is a much more viable option for most investors. With the passage of the new tax law at the end of 2017, donor-advised funds became a far more useful tool for tax- conscious individuals and families who wish to make regular donations to charities. Contributions to charity are considered a tax-deductible expense that can be included among your itemized deductions. The new tax law does not change the deductibility of donations, but it does make it far more difficult to realize tax benefits from itemization. Starting in 2018, the new law increases the standard deduction to $12,000 for single filers and to $24,000 for those who are married and filing jointly. The law also limits state and local tax (SALT) deductions to $10,000, which includes property taxes. If you live in a high- cost, high-tax state like Illinois, your property taxes and state income taxes may well exceed the $10,000 limit; under the new tax law, you will not be able to fully deduct all of the SALT taxes you pay as you have in the past. These changes will make it more efficient for many taxpayers to simply accept the standard deduction, which may eliminate the tax benefits of their charitable donations. 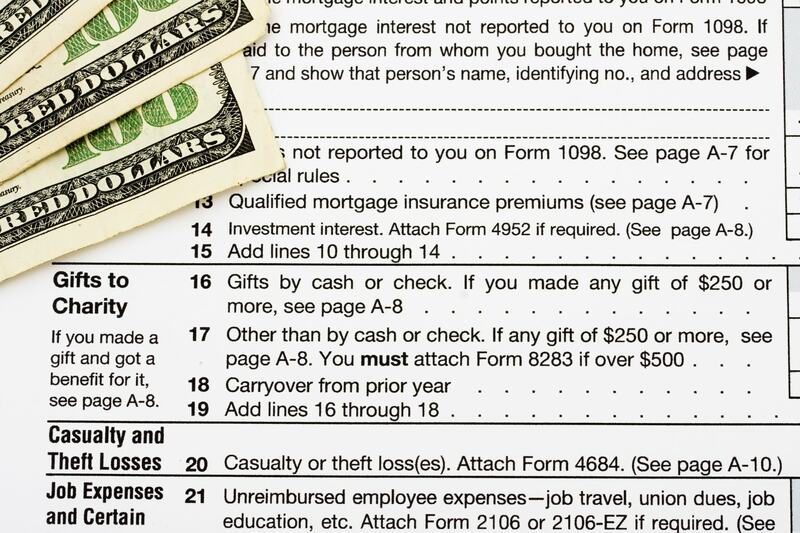 In prior years, making a $3,000 annual contribution to charities might have lowered your tax burden, but under the new tax plan, this gift may not have any financial impact on your taxes. However, a donor-advised fund may allow you to make contributions as you see fit while also maximizing the tax benefit of your donations. For example, let’s assume that you give roughly $5,000 per year to various charities. With a donor-advised fund, we might encourage you to contribute $25,000 once every five years, thus maintaining the same rate of annual giving. With this strategy, you would contribute enough to take advantage of itemizing your deductions and still be able to distribute $5,000 per year to charity. Because a contribution to a donor-advised fund is immediately tax deductible, you can enjoy the tax benefit of a contribution in year one and yet make your charitable donations thereafter at your discretion. Using a donor-advised fund to bunch your deductions can be better for charities as well. In the wake of the new tax law, charities are concerned that they will see a reduction in donations due to the inability of some taxpayers to continue itemizing their deductions. You can bunch your contributions by directly donating to charities, of course, but those charities are likely to see cash flow spikes and dips as a result of this strategy. Using a donor-advised fund allows you to continue to give more consistently, which your favorite charities typically appreciate. In addition to the tax savings that can be generated from bunching your contributions and itemizing your charitable appreciated financial assets to your donor-advised fund. You generate tax savings from the tax-deduction of your charitable donation. You generate further tax savings by avoiding potential capital gains taxes. Gifting appreciated assets can significantly reduce your tax liability and enhance the flexibility of your portfolio, making portfolio rebalancing less financially painful. Even with the preferential tax treatment of long-term capital gains, the amount of tax can be considerable, and donating appreciated assets can help minimize what you owe to the IRS. If the couple made $5,500 in contributions to their favorite charities, this would increase their itemized deductions benefit from itemizing deductions on their 2018 taxes. In other words, they would not have generated any tax savings from their charitable gifts. 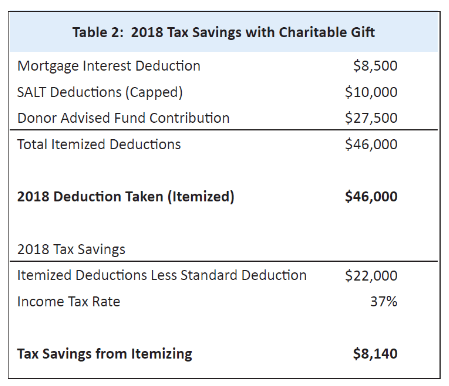 However, if the couple instead made a $27,500 contribution3 to their donor-advised fund in order to pre-fund five years of charitable gifts, this would increase their itemized deductions from $18,500 to $46,000, allowing them to fully itemize for 2018, as shown below in Table 2. In this example, they reduced their taxable income by an additional $22,000 over and above the standard deduction level. At the highest Federal income tax bracket of 37%, that represents $8,140 in tax savings. Let’s also assume that the couple chose to make this $27,500 contribution to their donor-advised fund via appreciated assets with an unrealized gain of $27,000. This produces tax savings as outlined below in Table 3. The couple would save an additional $5,400 in taxes by donating an appreciated asset and avoiding the capital gains tax on the $27,000 capital gain. 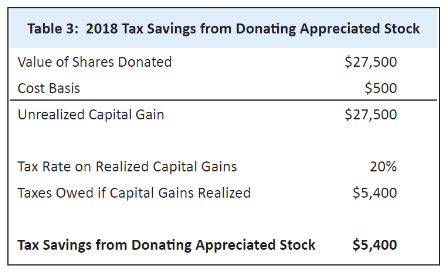 Overall, the couple generated $13,540 in tax savings using a donor-advised fund and bunching multiple years of contributions into a single donation.4 Furthermore, the couple can now take their time in giving away that $27,500 to charities of their choice, while also investing the capital for growth. Thanks to the tax savings donor-advised fund strategy, the couple effectively spent $13,960 to give away $27,500 before accounting for any growth of their assets. Even for those who are already able to itemize under the new tax law (for example, someone with a large mortgage interest deduction), using a donor-advised fund to bunch donations still has the advantage of providing a greater tax benefit right away. Due to inflation and interest rate changes, a dollar today is worth more than a dollar in the future, so maximizing tax savings in the current year still provides more benefit than stretching contributions over several years. Donor-advised funds can help make charitable giving easy and highly tax beneficial, especially under the new tax law. They provide the flexibility to make charitable contributions at your convenience, while simultaneously maximizing the tax deductibility of those contributions by bunching them into a single year. To support our clients’ charitable giving, Appleseed Capital waives our management fees on any assets that we manage for you in a donor-advised fund. We consider the fee waiver our own contribution to the causes that matter to our valued clients. If you would like to learn more about whether a donor- advised fund is appropriate for you, please call or email us to discuss. 1 Below a pre-determined asset threshold, certain custodians liquidate the contributions made to a donor-advised fund immediately. The funds are immediately reinvested in an investment strategy sponsored and managed by that custodian. The strategies afforded to donor-advised fund users are either indexed to various benchmarks or are actively managed. 2 If you have illiquid assets you would like to donate, please discuss this with us, as the process is much more complicated. 3 $27,500 = $5,500 in annual charitable gifts multiplied over five years. 4 In reality, the tax savings would be slightly larger, as the couple would benefit from saving on the 0.9% Additional Medicare Tax on their income and the 3.8% Net Investment Income Tax on their capital gains. In addition, if the couple live in a high tax state, there may be some state tax benefits as well. For simplicity, we have excluded these taxes from our example.